Glad to see you at my Red Couch today where I am serving Buttermilk Pie, which is really one of my favorite pies. Such simple ingredients combine to make such a flavorful and luscious pie. I have been making it for many years. The recipe is one of Martha Stewart's own and is in my copy of her book Pies & Tarts -- real pie and tart eye candy. One unbaked 8-1/2-inch pie shell, well chilled, plus additional pie crust for the leaves that line the edge of the pie. You can make homemade crust or buy a frozen crust and some pie crust dough in a box for the leaves. To make the leaves, I used a Nordic Ware leave cutout; you can also freehand it. The pie shell with leaves affixed. 1/2 cup (1 stick) unsalted butter, melted then cooled slightly. I use salted butter. Freshly grated nutmeg to taste -- or nutmeg from the spice container. I don't add a lot, but I love it in the pie. Egg Yolk Glaze: 1 egg yolk beaten with 2 teaspoons water. 2. 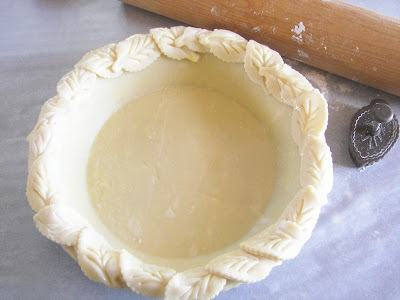 Affix the pastry leaves around the edge of the pie crust with cold water. Brush the top of the leaves with the egg yolk glaze. Refrigerate pie crust until it is ready to be filled. 3. Combine the sugar and the flour in a large mixing bowl. Add the beaten eggs and mix well. Stir in the butter and the buttermilk. 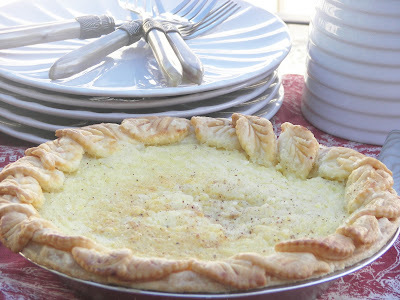 Stir in the lemon rind and juice, vanilla, and nutmeg, and pour in the prepared pie shell. Place the pie in the center of the oven for 15 minutes. Lower the heat to 350 degrees and continue to bake for approximately 40 minutes, or until the filling is set. Remove from the oven and serve at room temperature. Red Couch Notes: As all ovens vary, watch the baking times carefully. I baked my pie for about a total of 45 minutes, which is less than Martha indicated. I also put a foil collar on the edges after awhile so the leaves wouldn't burn. The pie is ready to be served. You can add some raspberry sauce and raspberries to top it -- yum! I hope you bake some pie today. Thanks for stopping by Red Couch Recipes. The leaves are beautiful, even the cutter is cute! I think I may have everything here for this now, and if so, I'm making it. I just bought buttermilk a few days ago for Italian Cream Cake and I've always got leftovers that I never know what to do with. I can't wait to try this! I had to come here and see what buttermilk pie is and it is so yummy looking! Then to top it off with raspberries or strawberries?! Oh mama! You got me drooling now. 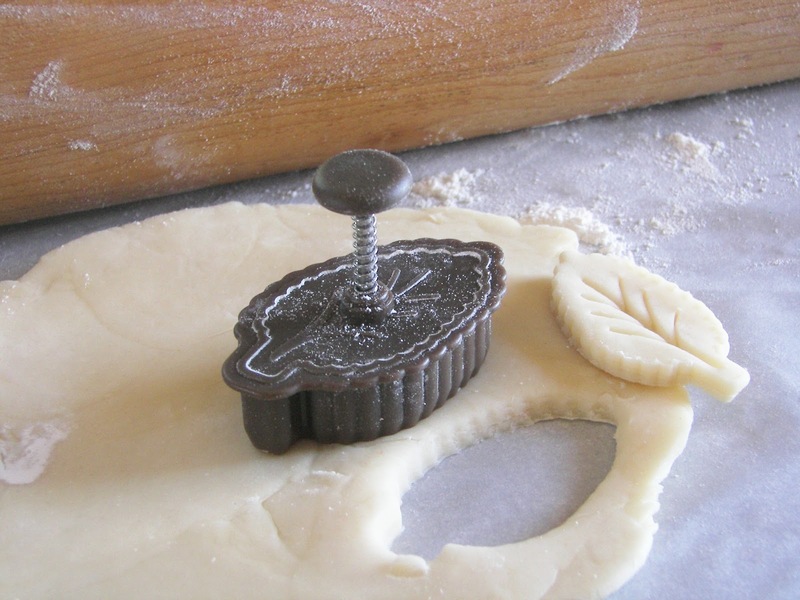 It's funny but I was just thinking of making a pie and using a leaf cutter for the edge! Now I see it would look beautiful! Thanks for sharing! Oh, this looks both scrumptious and beautiful! I love the leaves that your made...what a pretty addition for autumn! Mom actually just made a buttermilk pie the last time I visited and it was simply good! I will have to make one for myself sometime. It sounds wonderful, and I'm going to make it for our Labor Day weekend festivities! Thank you for making my dessert menu easy. I don't think there's a pie in the world that I'm not willing to try! Buttermilk pie sounds like it should be sitting on a red checked farmtable and there should be birds twittering in the background! So country good and yummy! Your pie is so pretty. I have those leave and love them! Since I do not cook much anymore, I sure would enjoy a big slice of this pie. My mother used to make the best buttermilk pies. Hmmm. This is my second week back on Weight Watchers so I probably should refrain from baking today, but in a couple weeks....watch out. I've never had buttermilk pie. It sounds delicious though. I hope you will be joining in on the fun at my blog tomorrow. Have a great day! Thanks for stopping by and your sweet comment. Looking to your Girard's post also. This pie is one I have not made yet and I so love pies. I am going to give it a whirl. Do you mind if I link back to you for the recipe with a picture of my pie? Hope it looks as great as yours does. Thanks for sharing. Being a Yankee transplanted to the south, I love Buttermilk Pie, but it's not something I grew up with. You have taken it to the next level with the leaves. So beautiful. The pie looks wonderful. I've never had a buttermilk pie. My mama used to tell me they were really good. I like the leaves you made for the top. I kind of pride myself on being a pie baker, but this is one that I have never made. Think you just inspired me to! I'm not a great pie maker like my mom is, but I would still love to try this. That's exactly the type of taste I love. I love the leaves on the crust, too. The pie crust is really cute! Looks professionally done, Joni. I make up a menu every week and one item I already had on for next week was the Courtland Buttermilk Pecan pie. So we're kind of on the same wavelength...mine is by Martha too...Martha from Lines at Linderhof! Thanks for visiting my blog and for your sweet comments and have a blessed day. This is really similar to the one I make. We just love this. Your little leaf punch isbkiller!where did you get that? My mouth is just watering and I even have buttermilk on hand! Yum yum. I've never heard of buttermilk pie - I wonder what it tastes like. I'll have to try it. I haven't had buttermilk pie in years. Now I am going to be craving it until I make one! I love buttermilk pies but my favorite is buttermilk pecan!!!! They are great! What a beautiful pie, Joni! I've never tried making a buttermilk pie before. I love those leaf cutouts. Time to get mine out soon! My father dearly loved buttermilk pie, so your post brought back a pleasant memory. Oh, this looks heavenly and I bet it tastes so, too! Joni, I went to Target and found these adorable dough cutters! Thanks for letting me know where you got them -sooooooo cute! 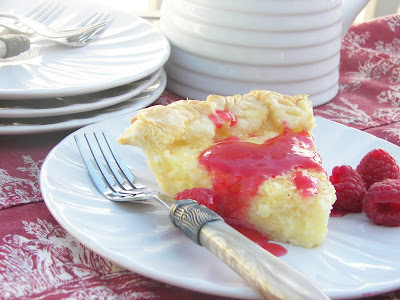 Sometimes classic recipes are classics for a reason - buttermilk pie is one of them ~ yours looks lovely! Oh my, that pie crust is too pretty to eat. Thanks for sharing at Wow. Your pie looks delicious! I had just looked at a pie recipe that had the leaf cutouts covering the whole top of the pie. Looked great but I could not find the leaf cookie cutter. So, thanks for sharing the picture of yours now I know what to look for.